There were 4 fabulous instructors at SewDownPortland. We had a 3 hour class with each instructor over 2 days. On Saturday, I had my first class with Sherri Lynn Wood who blogs at daintytime.net. 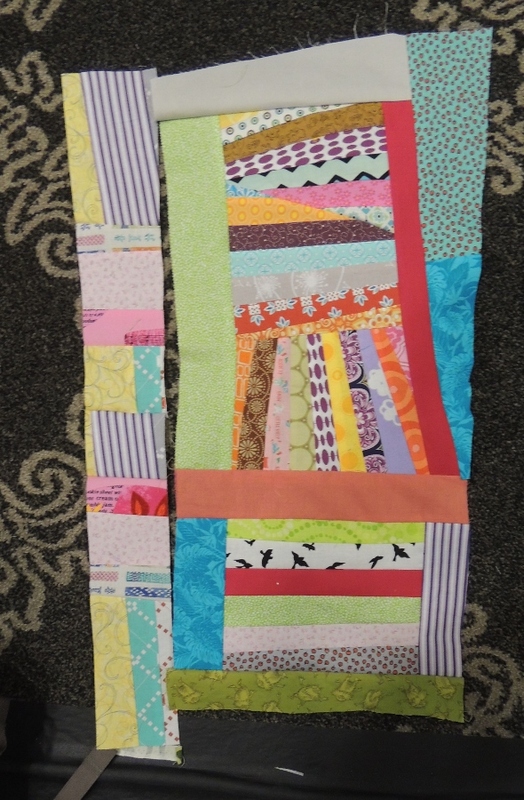 Her class was a twist on Improvisational Quilting in which we sewed a round robin. Which meant we first created a block as the conversation piece… and passed it along to have others add to our work! I brought a pallet of grey and black fabrics with small hints of yellow. Each person also kept aside a “signature fabric” that we added to every top we sewed on. The first time we passed our blocks, I received the block from the person sitting across from me (Denise from Kansas City MQG). I mentioned that the class was 3 hours long, right? Sherri did an amazing job describing the process to us and doing and initial demonstration. By the time we took 20 minutes to create our blocks… we were over an hour into the class! We spent 20 minutes on each “pass” in which we added to what we received. I did not get a “before” shot of the second block I worked on, but it turns out that 20 minutes is not that long an amount of time! 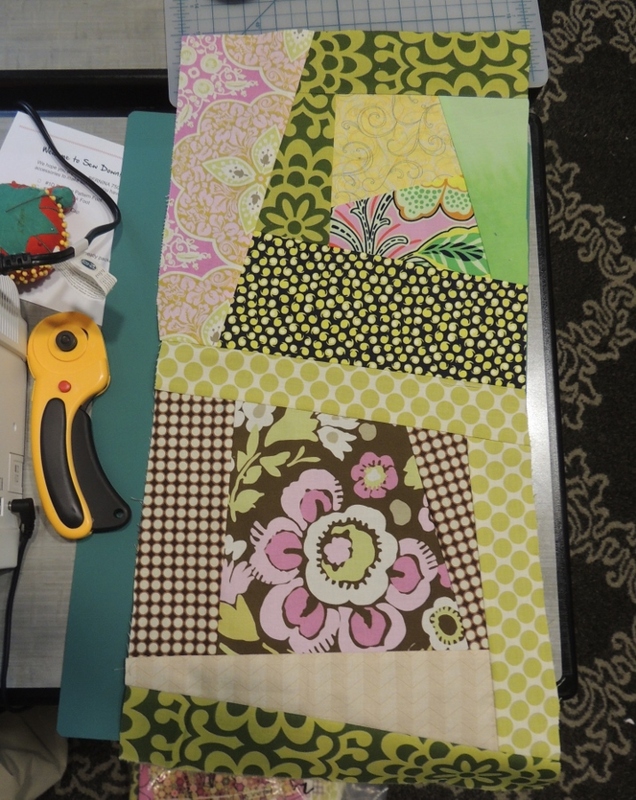 In this case, I worked on a pieced edge to add to the original block but I ran out of time to actually sew it on. I did notice that the next person who received the block quickly added it on for me. I have to admit, when I got the last block that I worked on I pretty much panicked. 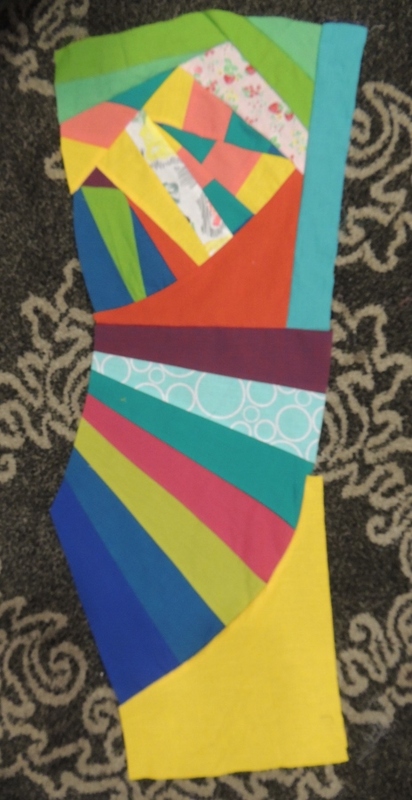 One of the techniques that Sherri demonstrated was how to use and sew gentle curves. This looked like a nightmare to me! However, I trimmed up the yellow on the lower right and went after it… and hopefully I was able to get it to a pretty good state before handing it back to its owner. During this process, we did not use any straight edges, and I have to say that was a bit of a challenge, but I found the time constraint to be a bigger challenge. The energy in the room went up every time we passed the blocks along, and by the end we were all pretty keyed up! We all circled around to look at the final results, and one woman commented that she really enjoyed working on my block (she added the piece with the red signature fabric) because she thought my direction was really clear! That was nice to hear! I personally thought that the addition of the big chunk of pink fabric was a bit… loud… so at open sew later that night I make a few more blocks to eventually add and I modified the pink area a bit, too. Saturday afternoon I had Heather Jones‘ You + Me class. Her quilt You + Me is a very bold, graphic pattern that looks wonderful with solid fabrics. Given the choice, I picked out my favorite colors to work with, and I was excited to get most of the quilt top pieced and completed! At dinner, Valori Wells discussed her design path and inspiration behind her latest fabric line. 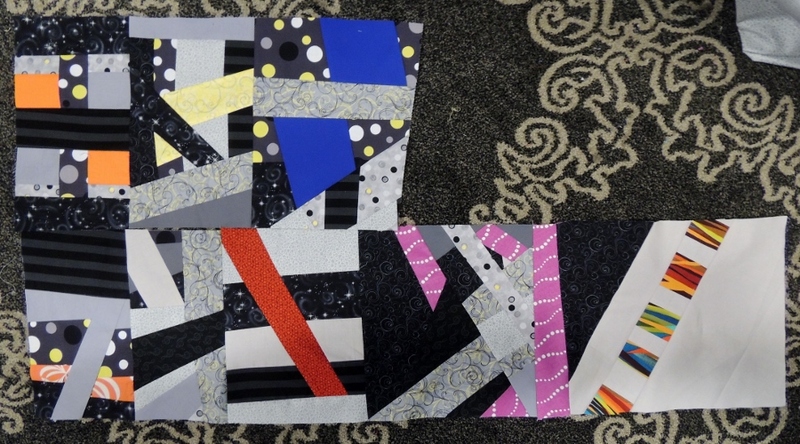 She is such a generous person – one of the instructors (Julie Herman of Jaybird Quilts) had shipped her kits to Portland via FedEx, but the bad weather kept it from being delivered. Julie called Valori, and Valori packed up a suitcase full of fabric to let us use! After dinner, mom and I took assessment of the weather situation. The weather had still not cleared, and the forecast called for freezing rain overnight and on Sunday morning. We were scheduled for a 7pm flight on Sunday night, which would have been fine in good weather, but with traffic all but shut down, we decided it would be safer to delay heading home to Monday. Thankfully the hotel and Southwest were accommodating, and we made quick adjustments and then stayed up until midnight sewing and having fun!